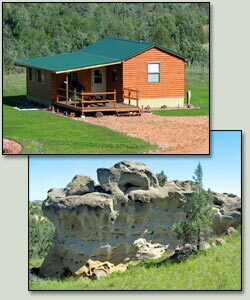 Scenic Badlands Cabin - Welcome to the most beautiful and scenic area of the North Dakota Badlands. 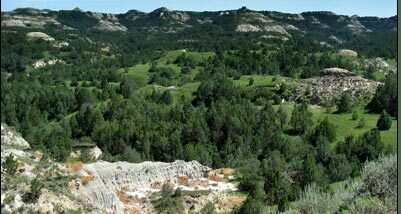 Scenic Badlands Cabin is located in the heart of one of the largest and most scenic juniper pine forests in the North Dakota Badlands. We welcome you to stay with us for a relaxing vacation in one of most beautiful and scenic area's of the North Dakota Badlands. Explore the juniper pine forests, unique sandstone formations and petrified trees. Enjoy the aroma of rocky mountain juniper trees, sage brush and wild prairie flowers. View and photograph a wide variety of Badlands flora and fauna. Hear the sounds of the wind blowing through the trees, the calls of song birds and the evening howl of a coyote. Hunters can just walk out the door and start hunting. This cabin was constructed by a bow hunter, for bow hunters. If bow hunting is your favorite hunting passion, this is where you want to be. Come, experience and enjoy your Badlands vacation! You earned it!